it was inevitable. i have the needles. i have the yarn. i have a list of patterns. i now have two socks in progress. however…. the first monkey is finished! 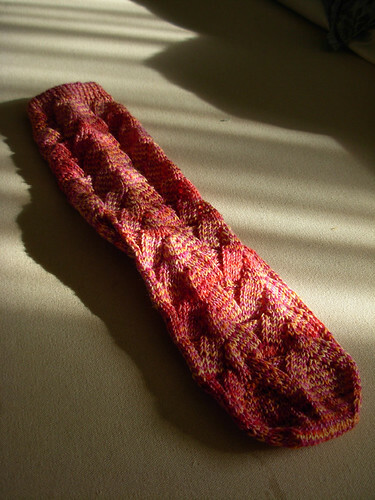 i have the cast-on started for the 2nd, and it’s a fun sock, so i’m not worried about ‘second sock syndrome’. but i did start a different pattern. this is the rococo sock in fearless fibers’ smoke colorway. the picture, unfortunately, does not show the pattern very well. 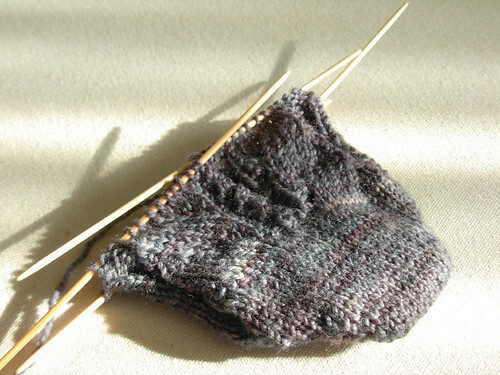 i’ve been avoiding it all summer as i had yet to attempt a toe-up sock (which somehow seemed more fearsome than top-down…i think because of the instructions for a short row toe), so i finally decided the only way to get it done was to sign up for the ‘small projects’ class at the lys. it’s working so far; i’ve actually made it through about 3 more pattern repeats since i took the pic. 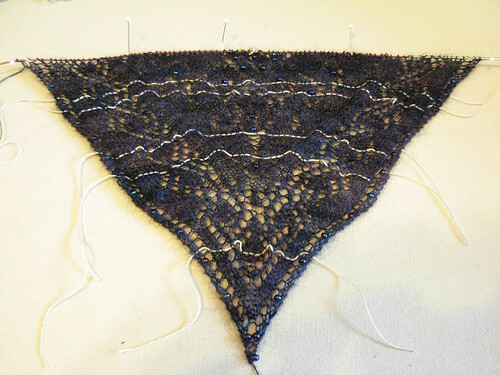 of course, not to be outdone, mystery stole 3 is making a re-appearance. after a bit of ignoring, a change of needles and a complete start-over (i firmly established myself as a ‘process knitter’ as i decided i would much rather just start over with the new needles than pick up from a lifeline after i watch half the stitches fall off the old needles…again. of course, this begs the question: what’s the point of a lifeline if i don’t use it?) i am finally past the first clue. which puts me at only, oh, 4 weeks behind or so. fortunately, i don’t care. now if only i could take a decent picture of the thing! Awww, your socks look fantastic – the Monkeys as well as the Rococo-one! What a very gorgeous pattern this latter is! But oy, toe-up! I have to admit that I didn’t dare to try toe-up socks so far, like you I am quite worried about the instructions for the short row heels! But I know you’ll be doing perfectly fine with them – looking forward to seeing more!